The Nissan brand has set a U.S. sales record in 13 of the last 14 months, Nissan said today. U.S. light-vehicle sales rose 8 percent to nearly 1.4 million in April, with strong retail sales and pent-up demand adding momentum to the industry’s spring thaw. Among major automakers, Nissan Motor Co., Chrysler Group and Toyota Motor Corp. set the pace with solid double-digit gains aided by redesigned crossovers and light trucks. The annualized sales rate, adjusted for seasonal trends, increased to 16.1 million from 15.2 million a year earlier, but still fell just short of projections. In March, the SAAR was 16.4 million -- the best showing since November 2013 and among the highest rates since early 2007. “Sales momentum from March rolled into April pushing the industry to its best back-to-back monthly sales pace since fall of 2007,” Bill Fay, Toyota division group vice president and general manager, said in a statement. The SAAR has now topped the 16 million mark four out of the last nine months, and analysts say the industry remains on track to generate U.S. sales of 16 million or more for all of 2014. Steven Szakaly, chief economist for the National Automobile Dealers Association, said low interest rates, the introduction of new or redesigned models and improving housing and labor markets continue to bode well for U.S. light-vehicle sales. “The broader economy is very strong,” Szakaly said. Automakers said retail sales remained strong in April, offsetting sluggish fleet deliveries, which remained weak as major rental agencies dialed back on purchases. Automakers also hiked new-vehicle incentives in April to extend the momentum from March, when sales rose 6 percent, analysts say. TrueCar.com estimates April incentives averaged $2,751, an increase of 9 percent over April 2013 and 1 percent above March 2014. "The pricing/incentive environment appears more competitive when you take into account juiced residuals, extended maturities, dealer stair-steps and pulse loans," Morgan Stanley analyst Adam Jonas said in a report Friday after April sales were released. "April was kind of disappointing and if we don’t see the SAAR hit a mid to high 16 million unit rate by May or June you can pretty much write off the year in terms of volume surprise." Jonas said a decelerating or stalling SAAR "at a time when automakers are seemingly adding more and more capacity doesn’t bode well for industry profitability." And if Japanese automakers continue to focus on share at the expense of pricing, Jonas warned "the value of SAAR will decline significantly even in a rising SAAR environment." Barclays analyst Brian Johnson on Friday trimmed his forecast for 2014 light-vehicle sales to 16.1 million from 16.2 million units. "Although the industry remains healthy, with financing still available and with the economy supportive, we believe underlying demand has normalized and we lack the deep well of pent-up demand necessary to achieve SAAR upside to 17 million units," Johnson said. Overall, light trucks led the industry's U.S. sales gains last month, rising 13 percent, while car demand edged up 3 percent. Among segments posting the biggest gains were subcompact cars, SUVs, premium crossovers and compact luxury cars. Deliveries were helped last month by pent-up demand after severe winter weather in January and February forced some consumers to delay purchases. “Retail demand was steady in April, and truck sales and transaction prices were especially strong,” Kurt McNeil, General Motors’ head of sales operations, said in a statement. “As we expected, the economy continues to strengthen. U.S. light-vehicle sales have now advanced 3 percent to 5.14 million this year. Sales rose 18 percent at Nissan Motor, 14 percent at Chrysler Group and 13 percent at Toyota. GM battled through its recall crisis for a second straight month to record a 7 percent gain. Hyundai also advanced, while Ford Motor Co. fell 1 percent in posting its third monthly decline of the year. 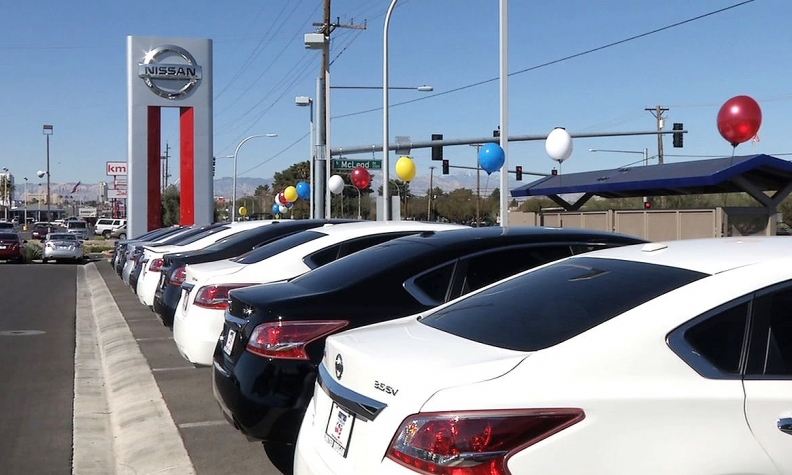 Nissan Motor set an April U.S. record with 103,934 units sold, with car deliveries jumping 24 percent and light truck demand rising 11 percent. Sales rose 19 percent at the Nissan brand and 17 percent at Infiniti. Toyota said sales rose 12 percent at the Toyota division and 28 percent at Lexus. Truck volumes were especially strong last month, the company said. Jeff Bracken, general manager of Lexus, said the brand has been helped this year by a luxury market that has expanded faster than overall light-vehicle sales. Toyota officials on Thursday said railroad delays continued to slow shipments from plants to dealers last month. They estimated that 190,000 units across the industry were built but waiting to be shipped, a level they said was about twice as high as normal. Subaru, one of the industry’s hottest brands, extended its streak of double-digit sales gains to 16 consecutive months with a 22 percent rise in April deliveries. Behind another surge at Jeep, Chrysler Group extended its streak of U.S. volume gains to 49 months. U.S. deliveries advanced 52 percent at Jeep, 22 percent at Ram, and 10 percent at Fiat. Volume slipped 21 percent at the Chrysler brand, while sales were flat at Dodge. Jeep’s U.S. sales, propelled by the redesigned Cherokee, set a monthly record of 59,754 units and have now advanced 30 percent or more for six consecutive months. 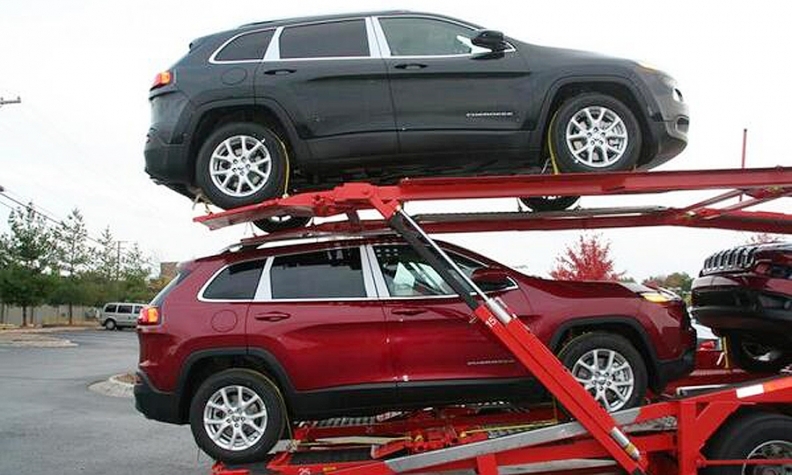 Overall, Chrysler’s light-truck deliveries advanced 34 percent last month while car volume slumped 26 percent. “The spring selling season is heating up,” Reid Bigland, head of U.S. sales for Chrysler Group, said in a statement. GM, which has been dogged by a recall crisis for about two months, said its 7 percent gain reflected an 8 percent jump in retail volume and a 5 percent increase in fleet shipments. Deliveries rose 13 percent at GMC, 12 percent at Buick, and 5 percent at Cadillac and Chevrolet. It was Cadillac’s first increase of the year. Sales of Chevrolet’s Silverado pickup rose 9 percent and GMC Sierra demand climbed 21 percent, while GM’s full-sized SUV shipments advanced 22 percent. At Ford Motor., sales slipped 1 percent on a 9 percent decline in car volume and 1 percent drop in deliveries of utility vehicles. Ford said retail sales slipped 1 percent and shipments to daily rental fleets skidded 24 percent. GM’s results exceeded analysts’ projections, while Ford’s sales fell short of estimates. Hyundai Motor America said it set an April record with sales of 66,107, up 4 percent, on strong deliveries of the Santa Fe and Sonata. Jeep's U.S. sales, propelled by the redesigned Cherokee, set a monthly record of 59,754 units and have now advanced 30 percent or more for six consecutive months. The Volkswagen brand’s woes continued with April volume off 8 percent. VW’s U.S. deliveries are off 10 percent year-to-date, and have now skidded 13 consecutive months. At the BMW Group, April U.S. deliveries rose 9 percent at BMW and 6 percent at Rolls Royce, but skidded 24 percent at Mini. Audi, helped by the launch of the redesigned A3, posted a 19 percent increase in U.S. sales last month. Jaguar Land Rover’s U.S. sales rose 19 percent in April; with Jaguar volume off 9 percent and Land Rover deliveries advancing 28 percent. Aided by the new F-Type coupe, Jaguar’s U.S. sales had advanced by nearly 30 percent or more each month beginning with May 2013. How can 1% growth feel so good?